Bound Rumford Falls Times newspapers, some from the late 1800's, have been donated to the Greater Rumford Area Historical Society, after untold decades in the attic of a western Maine newspaper. 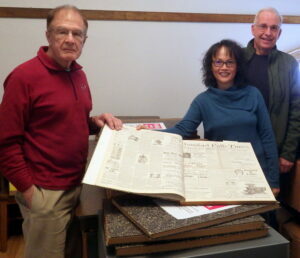 Pictured with an 1895 bound volume of the Rumford Falls Times are, from left, Greater Rumford Area Historical Society members Dennis Breton, Nghia Ha and Dave Gawtry. 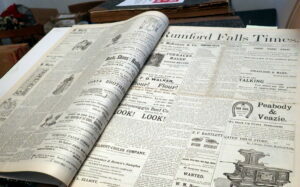 This is a bound copy of the Rumford Falls Times from 1895, which is in pristine condition. RUMFORD — Bound Rumford Falls Times newspapers, some from the late 1800’s, have been donated to the Greater Rumford Area Historical Society, after untold decades in the attic of a western Maine newspaper. The offer to donate the papers, located in an attic, was made by the Advertiser-Democrat in Norway shortly before they vacated the offices for a new location. Society member Nghia Ha said the bound volumes are from the 1890’s, with many years from 1940-1968, all in pristine condition. She said these bound volumes are not for public use, but will be used as part of a digitalization project that would enable people to access the Rumford Falls Times by internet. The bound papers are filled with articles of national and local interest. Within an issue from February of 1895, interesting advertisements included Androscoggin Beef Co. of Rumford Falls advertising “cheap” prices on a car load of flour direct from the west; and Israelson & Marx of Rumford Falls advertising a free lifesize portrait with a purchase of $10 worth of goods. She added that the papers are on microfilm, but it is not in good enough condition to be converted to PDF. She said the downside is that the society might have to sacrifice some of their brittle hard copy collection to have this done. Ha said the society has the weekly newpaper dating back to its beginning in 1883. Ha added that if some cases, they have just the one copy. Gawtry said the Canton Historical Society has more Canton Telephone papers at their society than the Rumford Historical has, although there may be some overlap. “One of their members works at the Maine State Library, so that’s a real plus,” he noted. She said at one time, the quoted cost to digitize everything was said to be around $10,000, just back to 1990. “It’s a big project and a huge expense. With the older papers, the digitization process becomes more difficult. Gawtry said the newpapers the society has in the boxes are not nearly in as good shape as the bound volumes. Gawtry said the digitization process will be accomplished, using two sources. For papers that are not in pristime condition, there are private companies that will go to the expense of making the adjustments and contrast to the news papes, which takes time. Gawtry said they’ve got quotes from private companies that will do it. “When you pay for something, you’re going to get better quality. But if you don’t have the money, the next best thing is to have the Maine State Library do it. The Society is actively pursuing grants for this project. As for donating, Ha said ways include making the Rumford Historical Society part of their estate planning. They can make memory donations. Breton said, “It would be a great thing to have. Donations can be sent to the Rumford Area Historical Society, 145 Congress St., Rumford, ME 04276. The Greater Rumford Area Historical Society is a 501c3 non-profit organization. It relies on a membership dues of $10 per person per year; individual donations; and fundraising projects each year including a plant sale and yard sale to meet its annual expenses.